Talent development is one objective of the Fund's grant programmes. Its Talent Development Programme is aimed at discovering and encouraging up-and-coming talent: designers and makers who graduated no longer than four years ago. They receive a grant that allows them the leeway to develop their artistic competencies. Each year-long pathway concludes with a public presentation during the Dutch Design Week in Eindhoven, in which all the designers participate. The programme includes the Grant Programme for Talent Development with a single application round per year. In 2014 the programme was expanded with a Grant Programme for Talent Development in an international context. Thanks to an extra contribution from the Ministry of Education, Culture and Science (OCW), every year there are four grants of €25,000 available for a collaboration between a creative who ranks among the international vanguard and an international (presentation) institution or organization. At the start of a calendar year, the Fund issues an open call to young/up-and-coming designers and makers to apply for the grant. An interdisciplinary selection committee comprised of architects, designers, lecturers and curators selects the most promising young creatives in two stages. The selected parties receive €25,000, part of which can be spent as desired on personal development, part on the development of knowledge in the domain of practice development, and part on a final presentation. Besides the sum of money, creatives who receive a grant are offered a programme that is tailored to the group. Taking the form of several meetings, this programme aims to offer expertise that is beneficial for all the selected designers. The programme, which is based on designers' development programmes and drawing up an inventory, focuses on establishing their personal practices, addressing areas such as finances, communications, branding and presentation. publication (in Dutch): All the information about the selected projects, selection procedure and meetings organized within the Talent Development Programme has been compiled in the Mid-term report on Talent Development. 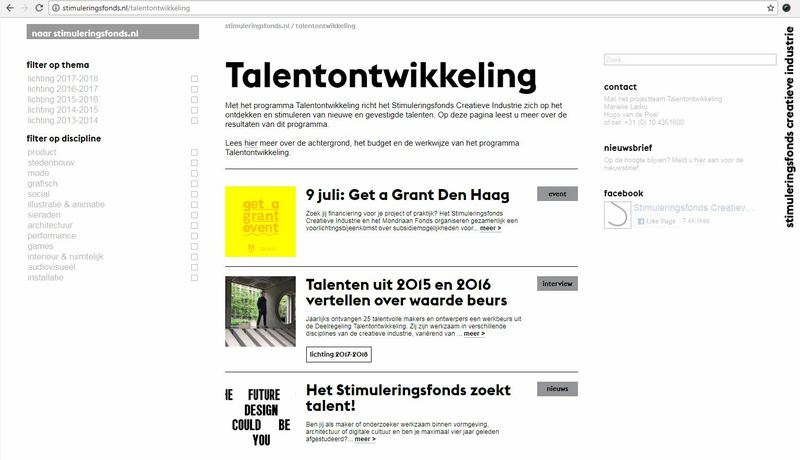 website (in Dutch): The Fund shares all the expertise, research and experiences that are amassed within the supported projects on its Talent Development website.